The first on-top-of-it person handing me their Christmas letter is my queue to start writing mine. Before we even get into, I'd like to say this is something we should feel free to slash from our holiday to do list if it steals our joy a.k.a. stresses us out. Or, if we don't want to slash it completely, we should open our minds to what could be (e-versions, printed envelopes, easier family photo) instead of mindlessly following the status quo. I'm asking myself, is the "right" way right for me? The printing stress is second only to portrait stress. Getting us all pretty - simultaneously, and coordinating, but not too matchy-matchy is enough to drive me crazy. Especially when I give myself an itsy-bitsy budget. This year slipped by without us taking any family portraits. I wasn't up to it. 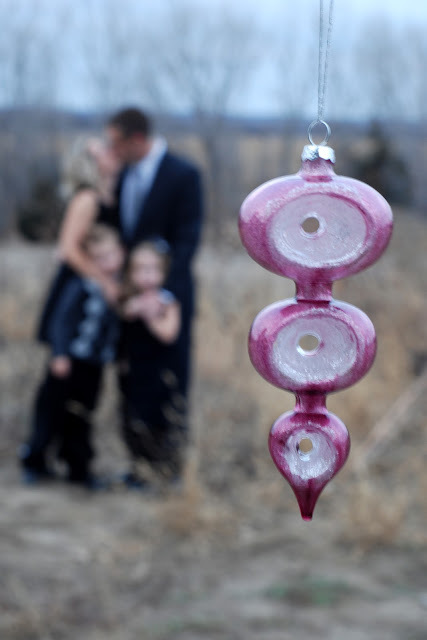 Then we were headed to a wedding and all of us were wearing black or grey and I remembered a photo of a couple who was blurry in the background, while the camera focused on an ornament. "That's it," I thought. "Doesn't matter if everyone's looking at the camera or if someone's grumpy. Perfect." So we took the photo below outside the church and spent fifteen minutes at the most. Easiest. Portrait. Ever. if this isn't your dream photo, I found other Easier photo ideas here. I hope whatever process you find yourself in the middle of goes smoothly and that you'll retain your holiday cheer if your printer decides to start streaking. The secret to happy times has to be giggling when most people would grouch. Sometimes I know the laughing option is there and it's better, but I just can't do it. If you're in that boat today, just don't beat yourself up. So counter-productive, not to mention mean. When in doubt, give yourself a break. I did last night. I swung by Starbucks on my way home and you know what? When I stopped over-thinking it, it felt good.